We enjoyed a full house of friends this week, 13 folks in all (9 adults & 4 kids). 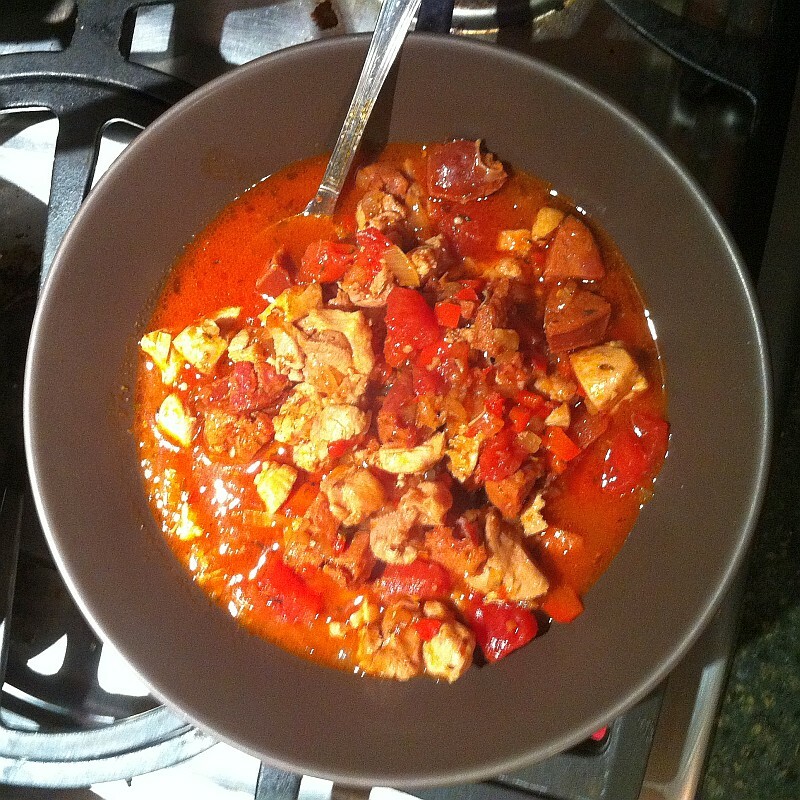 I had it in my head to make a Cajun spiced stew with some chicken thighs and chorizo sausage. The result was quite tasty, spicy at the first bite and providing a nice heat as I ate more. Line a rimmed baking sheet with parchment or aluminum foil. Evenly spread the vegetables over the pan. Roast at 450°F for 10-15 minutes and then continue cooking at 300°F for approx 45 minutes. At least once a year we have breakfast as dinner on Saturday night. If there is one food that I know the children who join us will eat their fill of it is pancakes. There are rarely any leftover cakes to be had. Fruit salad with papaya, mango, pineapple and green grapes. I saw a recipe somewhere earlier this week for a baked huevos rancheros and it sounded pretty tasty. I forgot to bookmark it and couldn’t find it later so I made one up using a few I found online. Preheat the oven to 400°F. Place 2 oven proof dishes on a sheet pan and set aside. In a saucepan saute the chorizo over medium heat for several minutes until some of the oil is released. Add the chopped jalapenos and cook for until aromatic. Add the caramelized onions, kidney beans, cumin, and about a 1/2 a cup of water. Stir thorough to mix the onions among the beans. When the pot comes to a boil lower heat to maintain a simmer and cook for about 20 minutes. Add salt & pepper to taste. When the beans are cooked split them between the 2 oven proof dishes. Spread salsa over the beans. Make a depression in the center of the beans and crack an egg into each dish. Bake for 15 minutes, rotating the pan once. Turn on the broiler and sprinkle the cheese over each dish. Broil for about 5 minutes or until the cheese is bubbling. Serve with sour cream, additional salsa if desired and tortilla chips. When we gather for Saturday night close to someone’s birthday I try to ask them ahead of time what they would like for dinner. Our friend’s daughter V’s birthday was coming up and she asked for just about everything we had on this list. We caramelize onions using a method demonstrated by Alton Brown in the Good Eats episode “A Bowl of Onion”. Since his show has ended it’s run on Food Network I thought I would jot down the recipe here in case they pull it from the site. Trim the stem end of the onion and remove the skin. Using a mandolin cut the onions into 1/8″ slices (aka rings). If you don’t have a mandolin then cut the onion in half stem to root and cut half moon slices. Heat an electric skillet to 300°F. Add butter and melt. Cover the bottom of the skillet with melted butter. Add a layer of onions and sprinkle with a little salt. Repeat layering onions and salt until all onions are in the skillet. Cook uncovered for 15-20 minutes. Do not try to stir during this period; just let the onions start to reduce in volume. Stir occasionally until onions are dark mahogany and reduced to approximately 2 cups. This should take 45 minutes to 1 hour. We typically serve caramelized onions along with sour cream along side perogis, succotash and some type of pork product.